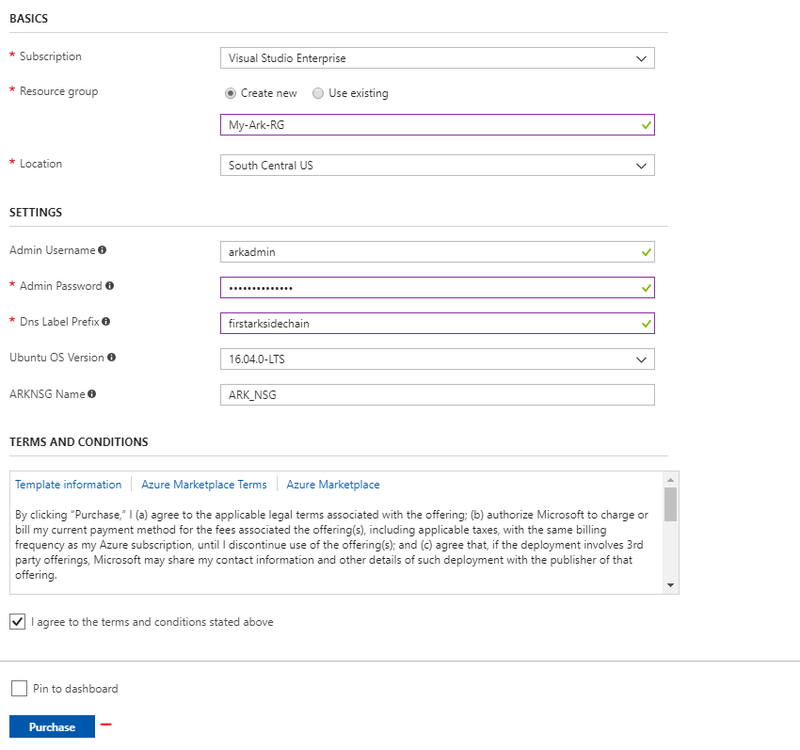 Pre-Requisites: Active Microsoft Azure account (Trial is OK) and basic knowledge on how to connect via SSH (E.g. 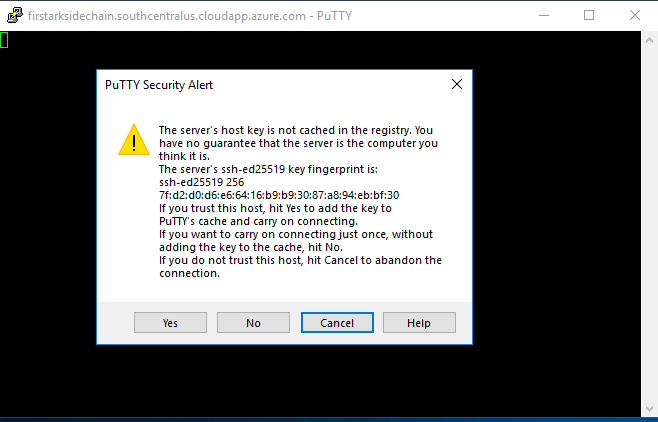 PuTTY for Windows). 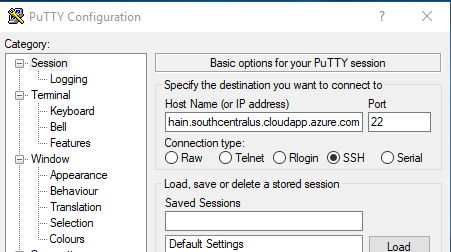 Click on the big blue “Deploy to Azure” button to be taken to Portal.Azure.com. Login with your account (Trial or not, either work). Subscription — If not already on your current one. Resource Group — ‘Create New’ only option that will work unless you wish to edit the template yourself. We will use My-Ark-RG for this guide. Location — Trial availability varies by region. Select whichever you are permitted access to via trial, or if paid, any will do. Admin Username — This is the account you will sign into the server with. Admin Password — Secure string and has high complexity requirements. 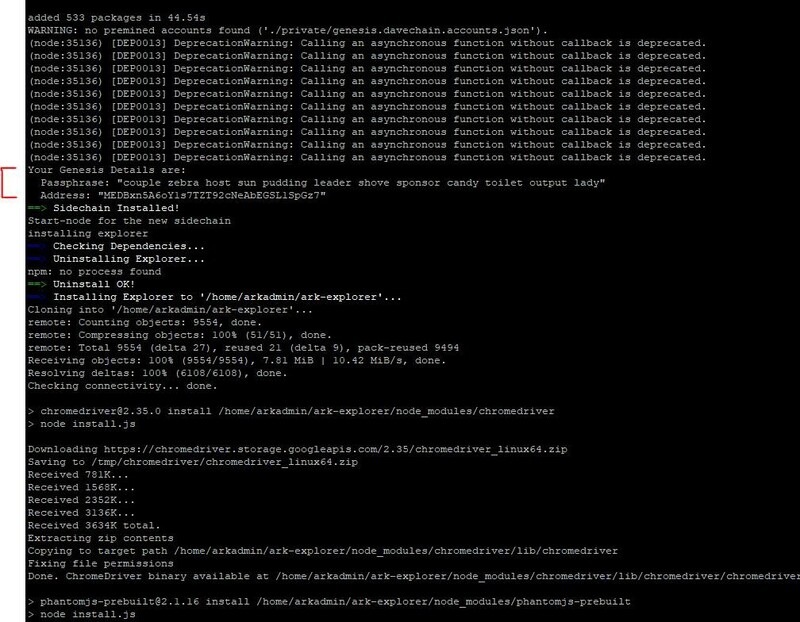 Ubuntu OS Version — Only option is 16.04-LTS at this time. ARKNSG Name — This is the name for the firewall group to permit SSH as well as Ark Node/Explorer port access to this VM. Currently, the VM produced is a Standard_A1 size VM. This is a very low-cost resource VM for tutorial purposes (can be scaled-up after deployment if desired or via template adjustment). Click ‘Agree’, and ‘Purchase’ to begin deployment. Should take 5–10 minutes. You are welcome to explore your new VM’s Overview, etc, by clicking on ‘Resource Groups’ and finding your new group, and the VM inside. There are lots of configuration items here. If you do not remember your Public DNS name or IP address (for SSH), go to: Resource Groups > My-Ark-RG > MyUbuntuVM > Overview. This has all the general information you will need. 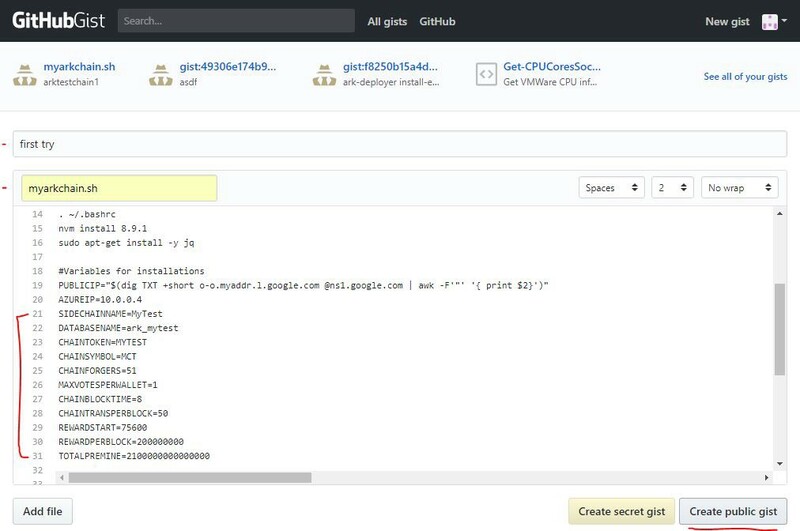 SSH into your new VM using the Public DNS Name and login with the credentials used during the VM Template deployment page. Login using the admin username and admin password that you input earlier in this tutorial. Starting here, is the default quick-installation method with the chain being named “MyTest”. If you wish to customize it, please see the bottom-most section of this article. This script will complete all of the installation steps to get both the node and explorer running for your BridgeChain, with all the default values. Total installation time is about 10 minutes. There is 1 important item to locate in the stream of data being output to the console (for wallet control, etc). Your Genesis Passphrase details! Just after the node gets installed, there will be 3 lines of text to record. Copy these lines outlined in red below. This information will be used later on, as you explore ARK past the deployment phase with ARK Deployer. Copy and paste it right out of the console window for safe keeping. This is the Public IP of your server, and the port required to view the ARK Explorer for your BridgeChain (4200). The API should be available on port 4100. You can highlight the URL straight from the SSH window, such as: http://13.65.29.3:4200 and hit CTRL+C to copy it. Paste into a browser, and voila! 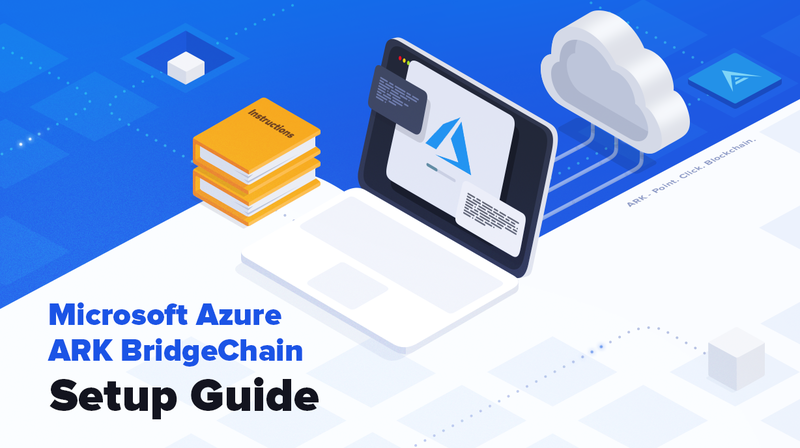 For more in-depth and customizable BridgeChain enjoy following along with the ARK Deployer guide going forward in your ARK journey. Welcome aboard ARK. 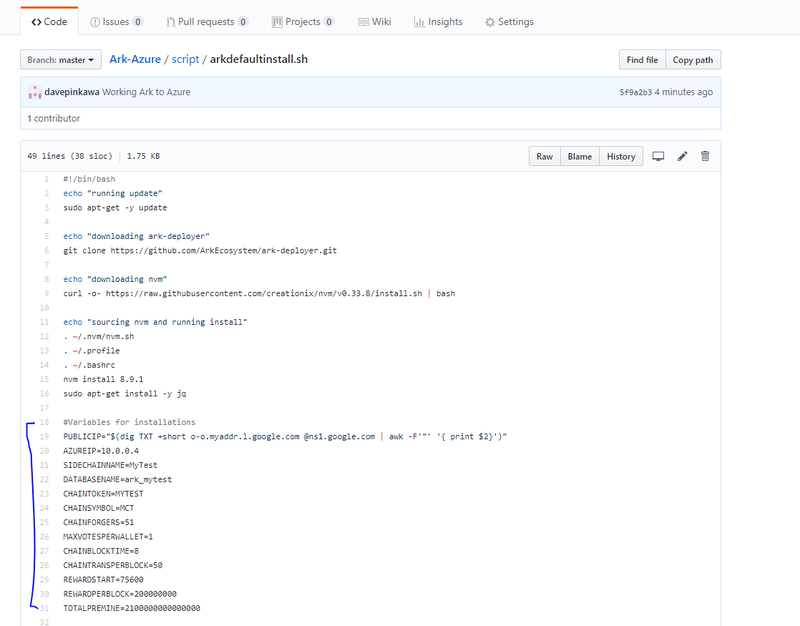 Special thanks to Walrusface for writing this guide and script, delegate Jarunik for sponsoring its development and our dev Alex Barnsley for testing and modifying necessary things in ARK deployer.